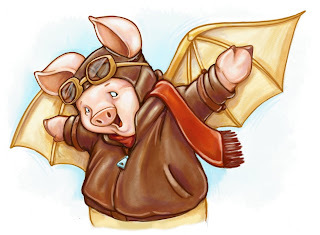 Being a piggy person myself, I really like your pig with his wings. I do hope they work! Has he taken a test run yet? Hi Scott, i love your artwork..have you used Painter IX for this design too? A lovely illustration and nice idea. well done this work, it´s really expressive. good choice about the subject. congratulations and regards! And pigs might fly! Great illustration. I suppose if pigs are really going to fly it’s about time that they take it upon themselves to do so. I've come across your artwork several times in the last few weeks. Great illo! I really enjoy this, great work. He took a small test run with limited success. I did do this in Painter IX from a scanned pencil drawing. What a nice unusual pig you've created! Really like his expression and wardrobe. Great job! Well rendered. Love the leathery texture of the jacket. Great illustrations! I love your work!!! Beautifully executed and the coloring is amazing! and then DIVE BOMB the wolf! wing him with a few watermelons or something! What a good idea. Great work. I like this piggy.